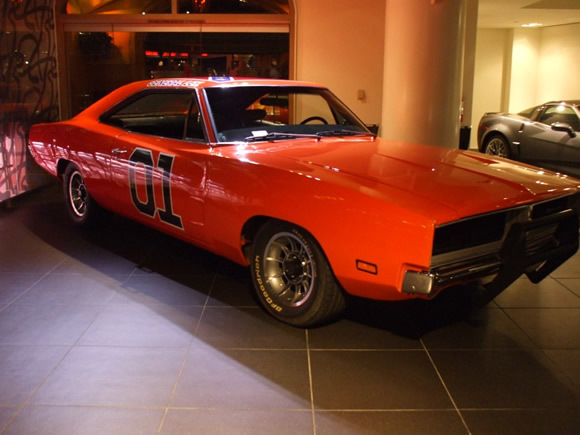 I was a big fan of the Dukes of Hazzard and was amazed at what Bo and Luke did in their Charger week after week. Years later I was amazed to learn the show almost single handedly destroyed all the 1969 Chargers ever produced. Well not quite but they used at least one per episode and by the sixth season had to start using miniatures. The stunts weren't the same after that. This 1969 Charge is owned by Jeremy in Las Vegas and is on show at the Palazzo Hotel. If you're in the neighbourhood check it out. Jeremy's got it for sale if you're interested here. It's an awesome car with a lot of goodies under the hood including a 425HP 383 big block. Sounds awesome too! Update: Jeremy has sold his car.